Dr. Dawne Moon. Photo courtesy of Marquette University. 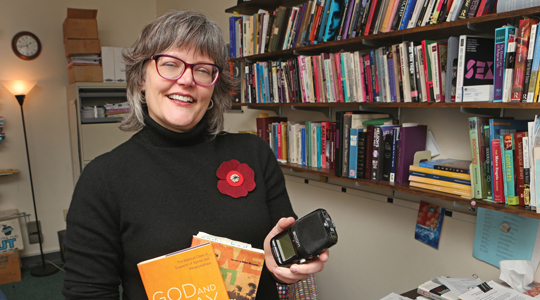 MILWAUKEE – Dr. Dawne Moon, associate professor of social and cultural sciences at Marquette University, has been named the 2015 Way Klingler Sabbatical Award winner. The annual award is granted based on prior scholarly research and potential for substantive contribution to the discipline. Moon will spend her yearlong sabbatical researching the shift in American political and religious culture to end an adversarial mentality toward the LGBT community during the past 40 years. Moon will write her second book while conducting research. Moon is regarded as a highly accomplished researcher with a long track record of publishing quality research from various projects. James Holstein, professor of social and cultural sciences, says the topic is significant to nearly all American religious institutions. “Dr. Moon’s work in this area has established her as one of the leading authorities on the sociology of religion, sexuality, identity and community. Her research promises to help us understand the dynamics of the ‘Christian-gay’ divide, but also has broader implications for our understanding of the ways in which any sort of conflict might be managed and reconciled without the sacrifice of treasured principles,” said Holstein. As part of the award, Moon is traveling the United States and Canada to observe leaders of the movement, interview them and attend national conferences held by a wide variety of organizations. “To write a book with the greatest impact, it is important that this study not be limited by regional effects but comprise the whole movement as it has emerged throughout North America,” said Moon.